Faced with the prospect of heavy FAA sanctions, Martha's Vineyard Airport (MVY) was under the gun to replace its aging, non-compliant aircraft rescue and firefighting (ARFF) building. When its new $10.4 million facility opens in November, officials will officially close the book on a difficult chapter for the county-owned airport located on a picturesque island off the southern coast of Cape Cod. In summer 2015, FAA put the Massachusetts airport on notice. After years of inaction and lack of response from MVY about a set of partial plans for a new ARFF facility, the federal agency gave the airport until the end of the year to submit completed plans. Its very license as a Part 139 commercial airport was at stake as well as millions of dollars in federal funds. Needing to act quickly, the MVY Airport Commission found inspiration for a solution just a few miles away in the recently completed Oak Bluffs Volunteer Fire Department facility. The commission instructed Jacobs Engineering, the architect that produced partial plans for the airport back in 2011, to retain Keenan + Kenny Architects, the firm that designed Oak Bluffs facility. The two firms collaborated to produce a final design specifically modified for airport use, and MVY is on pace to complete the facility on time and on budget. The new structure will house snow removal equipment as well as ARFF equipment and personnel. Airport Manager Ann Crook explains that the 2011 drawings commissioned under previous airport leadership represented a "Taj Mahal that was way more than what we could afford with the FAA grant." Specifically, the airport had secured an $8.3 million FAA grant for the ARFF portion of the building, but the full price for the facility was projected to be nearly $15 million. "If we went back to Jacobs for a total new design, it would have been six months and we would have lost the funding," adds Joseph Sullivan, manager with Daedalus Projects, the firm MVY contracted to supervise design, procurement and construction. Daedalus, which is based in Boston, served in similar capacity with the town of Oak Bluffs for its fire station project. "My thoughts were to make this a team collaborative effort, and we came up with a clear timeline to meet the FAA requirements," continues Sullivan. After inspecting the Oak Bluffs station in detail, team members determined that they could modify its design to create a facility for MVY. "It looked like the pieces could fit together," recalls Sullivan. "We had to incorporate the FAA requirements into the building to be an airport fire station." Construction of 14,674-square-foot building began last November and is scheduled to conclude this November.
" In the original design, the engineering firm was tasked with providing a state-of-the-art emergency response facility, and in doing so tried to include many state-of-the-art components, which drove up the costs," explains Sullivan. For example, the facility's equipment bays were to be air-conditioned. The new plans use high-efficiency mechanical equipment to reduce ambient humidity. 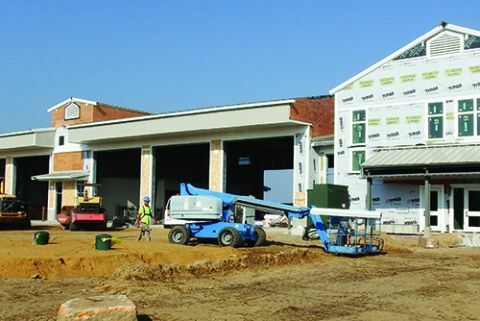 In a similar money-saving fashion, general contractor Dellbrook JKS used modular construction techniques to create the exterior walls. Unlike the original 2011 design, which called for an entirely "stick built" facility, the final design specified wall panels that were fabricated off the island and subsequently assembled onsite. "We don't feel we are settling," Crook notes. "It is a nice building that will give us what we need now and into the future." The building includes six service bays-three for firefighting equipment and three for snow removal equipment. Because the bays are designed with drive-through access, the building can simultaneously house 12 pieces of equipment. A 10-person crew will staff the facility. Geoffrey R. Freeman, a 25-year MVY employee who was promoted to assistant airport manager last spring, explains that the ARFF/airport operations team perform a wide range of duties-everything from fueling general aviation aircraft, painting, mowing grass and plowing snow, to fighting fires and conducting safety inspections. "They do it all," Crook relates. "The airport is so seasonal, we can't have a dedicated staff year-round for each task." The entire staff supports both commercial and general aviation operations. MVY has 10 daily regional jet flights by American Airlines, Delta Air Lines and JetBlue Airways on a seasonal basis. And Cape Air flies Cessna 402s to/from the island-15 times per day in season and 10 times daily during the offseason. Combined, the four airlines carry about 50,000 passengers per year. The airport serves even more passengers on private aircraft-everything from small single-engine planes to large corporate jets. The ARFF portion of the new facility has a watch room with direct contact to the air traffic control tower. Other elements include separate training and meeting rooms, office space, equipment storage areas and a new computer server room for the entire airport. The airport installed an extra, empty set of conduits to provide flexibility for meeting future data needs. The airport now has three bays for firefighting vehicles and three for snow removal equipment. There is also a bunkroom that houses staff during intense snow plowing operations. As an around-the clock operation, the airport routinely keeps one person on duty overnight to provide coverage for general aviation operations. The firefighting equipment that will be housed in the new station includes a 2002 KME 1,500-gallon foam truck, a 2002 E-ONE 1,000-gallon foam truck and a mutual aid emergency communications vehicle. The fleet of snow removal equipment includes a 2014 Kodiak snow blower/sweeper, a 2014 Kodiak plow, a 2016 TYMCO high-speed runway sweeper and four dump trucks equipped with plows. A jib crane will allow staff to maintain snow removal vehicles inside the new facility. Previously, they had to perform work out on the driveways. To bring the airport into FAA compliance, the new building has direct access to the airfield. The old building required vehicles to make a sharp right turn. The orientation of the previous facility made it challenging to respond to an airfield emergency within the prescribed three minutes, Freeman explains. The new building was built on the same footprint as the original structure, parts of which dated back to World War II, when it served as a boiler room for the old Naval Air Station that occupied the site. During construction, fire equipment was housed in a renovated county-owned hangar. The airport is raising a portion of its $1.6 million share by instituting MVY's first passenger facility charge, $4.50, in September. It also collects $1.3 million in annual lease payments from tenants in the 72-acre business park on airport grounds, notes Crook. The airport commission is exploring options to expand the business park that could generate another $500,000 in annual revenue. Putting it mildly, 2015 was an eventful year for MVY. In spring, the Dukes County Commission appointed a new majority to the airport commission; and MVY's long-time manager was gone before the end of the year. One of the primary issues came to a head in August, when the airport commission learned that MVY did not comply with FAA Part 139 rules due to years of inaction regarding its ARFF facility and deficiencies in the airport's wildlife management plan and runway markings. The FAA had awarded the airport an $850,000 grant in 2011 to design a new ARRF facility. Most of the funds were spent, but the designs were never completed. Flash forward to summer 2015, and the airport had just a handful of months to submit completed plans for an improved ARFF facility to avoid FAA sanctions. As the FAA issues bubbled to the surface, the airport commission tried to reach an amicable separation with the airport manager. When those efforts failed, it placed him on paid leave in mid-September, and he ultimately resigned in late November. The Vineyard Gazette noted that the embattled manager's 10-year tenure was "colored by heated legal and political battles over autonomy and authority" and his departure was preceded by "months of acrimony and legal tussles" with the reconfigured airport commission. The commission subsequently hired Crook, who came on board in May 2016 with nearly 30 years' experience managing airports in Oregon, Kansas, New York and Massachusetts. The personnel change cleared the way for movement on the ARFF project, and the airport ultimately avoided impending FAA sanctions. However, previous delays cost MVY federal funds that would have paid for a portion of the new snow removal equipment facility. "With the change in airport managers and the airport commission, Ann's expertise was very fruitful helping us put the pieces together," says Sullivan. Freeman also credits the New England FAA Region: "They played an important role and understood our situation."